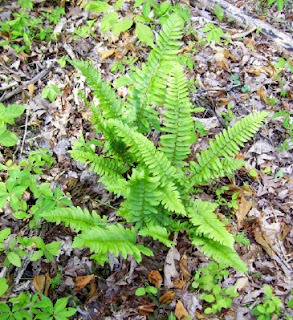 This is a wild fern often found in the Eastern states. I've transplanted it successfully, again and again. I always heard it was called the Christmas fern because it is the only woodland plant still green at Christmas (later, the old fronds brown as new fiddleheads emerge). This article suggests it was collected for Christmas wreaths. Either way, the Christmas fern is a beautiful, free plant you can dig for your shade garden--provided you have access to woods and forests nearby. PS-- I am having internet connection troubles, so posting may be sparse until problems are resolved. This makes me chuckle. Here in our "neck of the woods", the Pac NW, ferns are wild. They proliferate your garden so much you have to pull them up like weeds. That's what you get when you live in a rainforest climate. in australia we call them fishbone ferns.